My name is Victoria, I have 35 years old, I´m single and have no kids. I consider myself as a responsible, social, joyful and honest person. 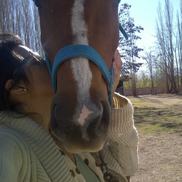 I love animals (specially horses), travelling, meeting new people and I´m always interested in learning different things. I´m a vegetarian since I was 18 so I´m very interested in everything that is related to vegetables, orchards, sowing and gardening ... I´m always there for learn and to improve my knowledge. I love the countryside and the city, but at this point in my life I'm looking for some tranquility away from my daily stress ... I would love to experience something new and different ... That was the mainly reason I opened an account in Work away .. I feel this is the moment to do it, so I´m gonna leave my job aside for a while (I´m journalist) and start this adventure. Sincerely I hope to enjoy it!